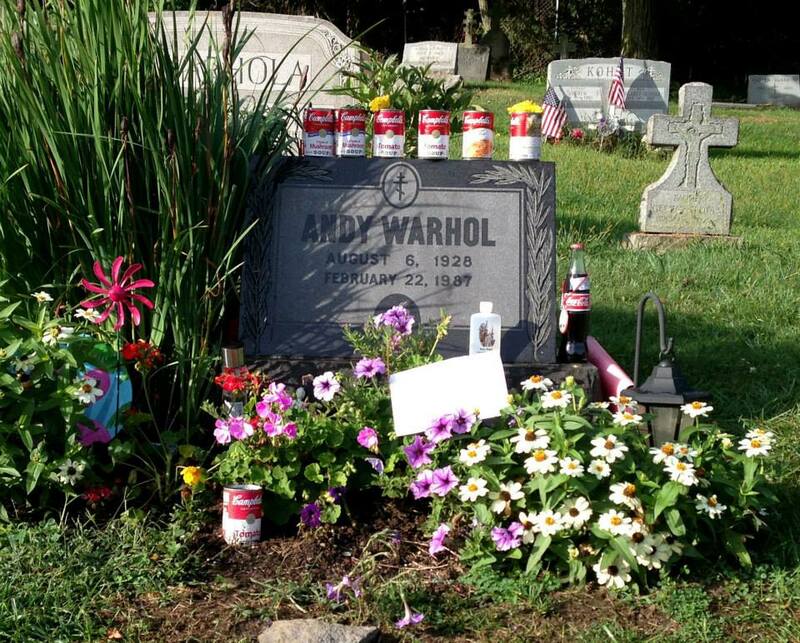 This couple was visiting Andy Warhol’s grave at 9 p.m. Saturday, Sept. 14. They spent several minutes at the grave and took many photos. When they walked into the camera frame while I was watching, it scared the crap out of me! 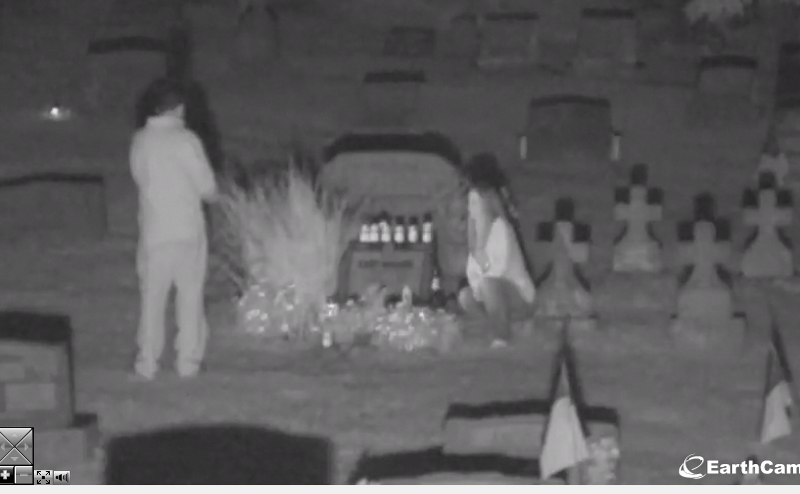 A grave cam—what a great idea! The Andy Warhol Museum and EarthCam launched this 24-7 video camera feed aimed at Andy Warhol’s grave on Aug. 6, on what would have been the artist’s 85th birthday. Warhol didn’t get his wish. The gravestone is inscribed with his name, his birth and death dates, and a cross. His parents’ tombstone (with the original surname Warhola) is directly behind his. I love that he’s buried at the family plot at St. John the Baptist Byzantine Catholic Cemetery in suburban Pittsburgh. I’m no Warhol expert, but I know he was so avant garde and non-traditional that I would have pegged him as the family rebel, someone to disavow everything he came from. But no, there he is in a simple Pittsburgh cemetery, this true original artist who went to Mass every day. Photo courtesy of Conversations with Andy. His grave has become a shrine for the hundreds of fans who visit each year. Artist Madelyn Roehrig has videotaped fans at the grave for almost five years and photographed the objects and notes they leave behind. While trolling my Facebook feed one day, I noticed my friend and colleague Brian Frink had been looking at the grave cam in the middle of the night (while sitting in an old, huge house that holds a lot of sad history in this area—he’s brave!). He made a comment about how he thought the grave cam was an entirely appropriate extension of Warhol’s work. Because Brian is a longtime artist and art professor at Minnesota State University, Mankato, I asked him to elaborate. “His work had a lot to do with the idea of celebrity and fame—things that in many ways transcend death, so I see this webcam as a weird extension of this idea,” Brian said. Brian said the webcam, especially at night, reminded him of Warhol’s black and white car wreck paintings, as well as the electric chair paintings, which Brian labeled “creepy as hell.” I agree. Warhol was both fascinated by and terrified of death, Brian said. “I can’t help but imagine that Andy would have created this grave webcam if he knew it was possible. So it feels like a post-mortem work of his, which is pretty cool,” he noted. On a side note, Brian saw Warhol in the flesh once. Brian worked as an artist in New York City, and sitting outside one day eating lunch, Warhol walked by. Of course, Brian and his friends were too cool to say anything! I picture Warhol as always surrounded by his entourage (of course he would be walking down the street with Nico, right? ), but Brian said Warhol was alone. But not alone in death, not with a web cam pointed at his grave.